Andraya is amazing and made the most beautiful flower arrangements for my daughter's wedding. Her bouquet was huge and stunning!! We were blown away by everything she created. She is super sweet and easy to work with too. Andraya at FLORA went above and beyond to make sure that our wedding flowers were perfect! 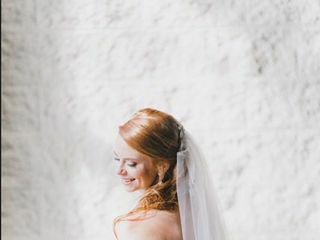 She is such a sweet and caring person, was easy to work with and was very helpful with the decision making process when determining the look that we wanted to achieve for the day of. Andraya had no problem working with the pieces we already had to display the flowers and was able to assemble everything on site the day of the wedding. She had a wedding at our venue the day after and was gracious enough to bring some items we had left back to her home for us to pick up later. We received many comments on how beautiful our flowers were and how they stayed beautiful for days after for those that took some afterwards. We would definitely recommend her to any future wedding couple!! 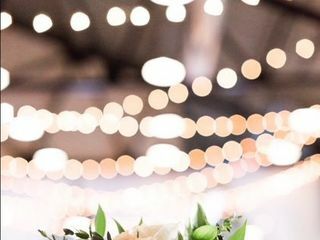 Flora was one of my favorite vendors at our wedding - Andraya and her team are so talented, accommodating, and flexible. First of all, the flowers are absolutely beautiful like something out of a magazine! 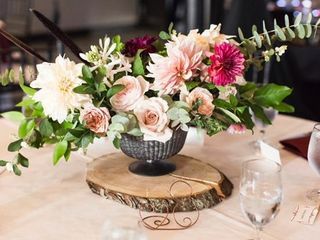 I didn't think we could have such beautiful arrangements at our wedding with our budget but Andraya worked with us and gave us many suggestions/recommendations. I even changed my mind last minute about the layout of our venue which affected the florals and Andraya was incredibly flexible. Without a doubt I would recommend Flora! Ryan and I met Andraya at "My Big Fat Fake Wedding" in Raleigh, NC. We knew instantly we wanted to work with her for our wedding! She truly listened to the look we were going for and did an exceptional job of bringing it to life! She was in constant communication with me with suggestions of what could work, sending pictures, and allowed me to ask all the questions I needed to. Her knowledge of flowers was like nothing I have ever seen, she told a story with the flowers that carried through from the bouquets, the ceremony, and to the reception. We cannot thank you enough Andraya!! :) such a joy to work with. The flowers from FLORA were one of my favorite parts of my wedding day. Andraya was so easy to work with. Our first phone conversation she understood my vision on exactly what I wanted. She was very flexible with change throughout the process and was open to ideas and gave feedback to keep my vision within my budget. I would highly recommend FLORA for any wedding! Andraya was more than we could have ever asked for in a florist. She was attentive, understanding and so wonderful. She put an importance on educating us in terms of what we wanted, how much it would be and any alternatives where other florists laughed and turned us away. She was a dream to work with in every step of the process. From consultation to design she constantly communicated to make sure that the florals were matching up with our vision. And when it came time to deliver, she did not fall short. I cried when I saw my stunning bouquet- with beautiful, healthy blooms and greenery. Our centerpieces were exactly what we envisioned, our cake florals were out of this world. The beautifully crafted cross spray was so beautiful. Everything was simple, beautiful, light and just so wonderful. We cannon recommend Flora more and we are so thankful that she was a part of our day! The BEST florist I could ever imagine for my special day. I wanted unique, bold and modern and she exceeded my expectations. Andraya is SO sweet and really takes the time to get to know you and your vision. Andraya was amazing! She is super sweet and was really easy to work with! She was also very flexible and willing to work with my budget when some of the florists I contacted were not, having a minimum price of $3K-5K for weddings. I also didn't have to spend any money on table decorations as the flowers/greenery she prepared were self-sufficient and she even had candles and votives that she let me use for free! From a giant eucalyptus wreath to cake flowers to flowers for my hair, I asked for a lot out of her besides the typical bouquets and reception decorations and she handled it masterfully. I absolutely LOVED how everything turned out and would recommend her to any bride looking for a kind, passionate and reasonably-priced florist! We were so thankful to have found FLORA Wedding + Event Flowers through a mutual friend! Andraya Northrup made our wedding day look like a dream! She completely understood my vision for wedding flowers and made it come to life. Not to mention she created the most beautiful flower crown for my bridal headpiece! FLORA is amazing! My husband and I have known Andraya for a long time now, and we hired her for full-service floral and day-of coordination for our June 4th wedding in Charleston. Having her was a God-send, especially since we live in Chicago - she really put our minds at ease about the entire planning process. Plus, her knowledge of flowers is incredible - that's not my area of expertise but I just told her the colors/style I was thinking of and she made the most gorgeous arrangements, bouquets and boutonnieres ever. Any other ideas we had for decor/festivities, she made it happen! I can honestly say Andraya exceeded our expectations and I would gladly sing her praises to any bride or groom! FLORA Wedding + Event Flowers is nothing short of amazing. My husband and I had to cancel our destination wedding at the last minute so I didn't give Andraya a whole lot of time to help make our new North Carolina, mountain-themed wedding come to life - but she was happy to do it! 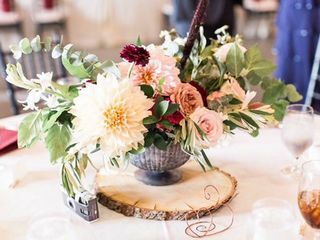 As an event planner myself, I have worked with countless floral designers in NC and truly none can compare. Andraya's professionalism, creativity, work process (everything from initial consultation, to itemized proposals, and vision boards to support those proposals...) are superior to anything I've seen and helped me completely trust her to execute one of the most important parts of our wedding. The flowers were magnificent - everyone's favorite part. 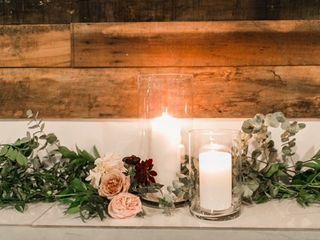 I had always dreamed of the design centering around floral at my wedding and pulling in the natural elements from outside. Andraya and FLORA made this happen and then some. I honestly couldn't recommend her enough. Andraya of FLORA could not have been better to work with. She met with my daughter and myself and took our scattered, jumbled up thoughts and ideas, and brought them to life with gorgeous flowers and arrangements. And to top it off, she's super nice, kind and patient! Thankful our planner, Ashley at Ashley Nicole Events, knew Andraya and got us together! I loved the flowers! They were just what I imagined from the bouquet to the table settings. Thank you! I am so glad I chose Flora for my wedding. Andraya was nothing but pure joy to work with. 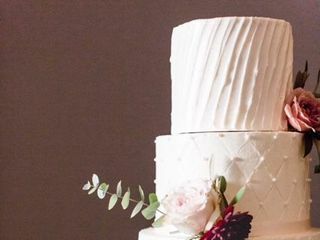 With all of the stress and anxiety that comes with planning a wedding, Andraya was the only vendor who always seemed to create a sense of calm and confidence that only an overwhelmed bride can understand. I completely trusted her to take my vision and create a reality. Not only did she accomplish what seemed near impossible she exceed every expectation imaginable with grace and class down to the most minute detail. She is truly an artist and a dream to work with. I am so grateful she was a part of our day! Andraya was such a dream to work with and made our wedding day so beautiful. She had a gorgeous vision for the wedding day when I came to her with some ideas, and executed them better than we had even hoped for. The lush and romantic arrangements looked like something straight out of the front cover of a wedding magazine. Her prices were very affordable and Andraya was responsive to all emails and calls, even making some changes for me in the days leading up to the wedding. She is also very kind and enthusiastic and cares about her work, so it was a pleasure to give her our business. Andraya's floral arrangements are breathtaking! As soon as I contacted her about creating the bouquets and centerpieces for our wedding I felt at peace. She was so organized and experienced I didn't have to worry about a thing. Everything came together flawlessly! The flowers were the perfect touch that brought all of our decor together! Andraya is extraordinarily talented and Flora would be an ideal addition to any event. Andraya planned our floral arrangements with a brilliant artistic sensibility! She listened to our design goals exquisitely and executed those goals with perfection. 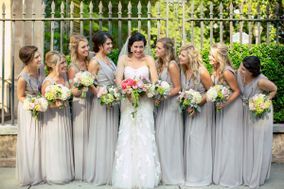 Seriously, most of my bridesmaids and myself spent the day swooning over the beauty of the flowers! We are so grateful for the opportunity to work with Flora and we wish Andraya all the best in the future. Cheers! Andraya creates special, fully customizable flowers and decor that you won't find anywhere else. She was our florist for our wedding and was flexible with my constantly changing ideas. From family to friends, everyone raved about the work she did, from the cake decorations to the unique archway. She's totally transparent and works with your vision to make it come to life. She is super sweet and down to earth and I know anyone who works with her will feel the same! Andraya is great and definitely a vendor I would recommend for anyone in need of a florist (especially sense I have already recommended her)! She was so personable, which was even evident in her delivery of creativity and style. I really appreciated all her input in our planning and the ways she helped make my visions become reality for our wedding day! Andraya was incredibly kind and helpful! She has great taste and ideas and is willing to give you the exact type of floral arrangement you want. I am very grateful to have been able to use her for our floral design. Highly recommend! 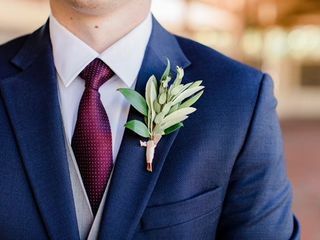 Andraya's arrangements/bouquets/boutonnieres for our wedding were beautiful, creative, and varied. Great to work with, understood our vibe from the beginning, and was so accommodating with number changes, item alteration, etc. She even brought flowers from her own yard to add to the bouquets (and let us add our own foraged rosemary without stressing)!